Reducing weight of components can significantly improve your product. Reduced weight can lower shipping costs, make your product easier to carry, or reduce the amount of energy required to move the component (aircraft, vehicles, etc). But how do you reduce the weight of components? 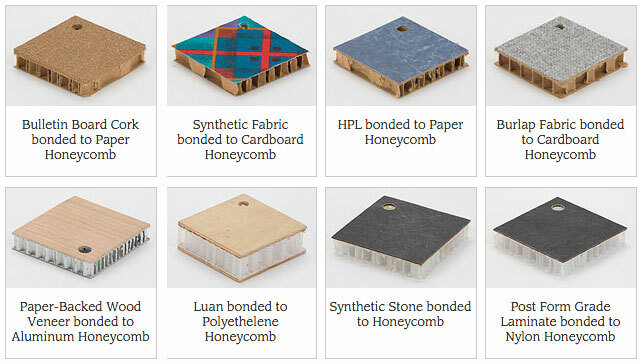 Replacing substrates with honeycomb material or foam is a popular solution. HMT Manufacturing produces a unique adhesive film that can bond practically any material to any substrate. It can glue fabrics, veneers, laminates, felt, carpet, and virtually anything to lightweight substrates such as honeycomb cardboard, foams, and other fabric materials. See an extensive photo gallery of materials that have been successfully bonded using HMT’s Advantage Laminating System for more than 40 years. These solutions are in place in the acoustical partitions, trade show, signage, and packaging industries. Would you like to receive a sample of your material bonded to a lightweight substrate using our adhesive? Request a sample today.